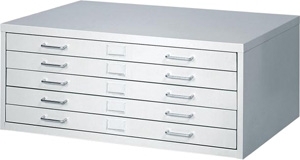 If you want a drawing storage file system, but don't have a big budget, consider Facil Flat Files by Safco. They are an economical solution for all non-archival storage needs. Functionally designed label holders and chrome drawer handles. Drawer capacity is 60 lbs. Unit can be stacked up to 2 high on closed base and one high on high base (bases sold separately). Available in Light Gray (LG) only. Be aware that Facil drawers are slightly smaller than regular flat files which may affect what size drawings or folders you plan to store. These work great, they are a little thinner and light weight compared to the regular higher priced version but they are exactly what we needed in our office. We're a small Design Build firm and we needed a good solid place to protect originals.